At the first day of ”Ceci n’est pas..” some Danish women have noticed the box, which is covered in metal shutters: ”It must be new.. it was not here earlier, right?”. 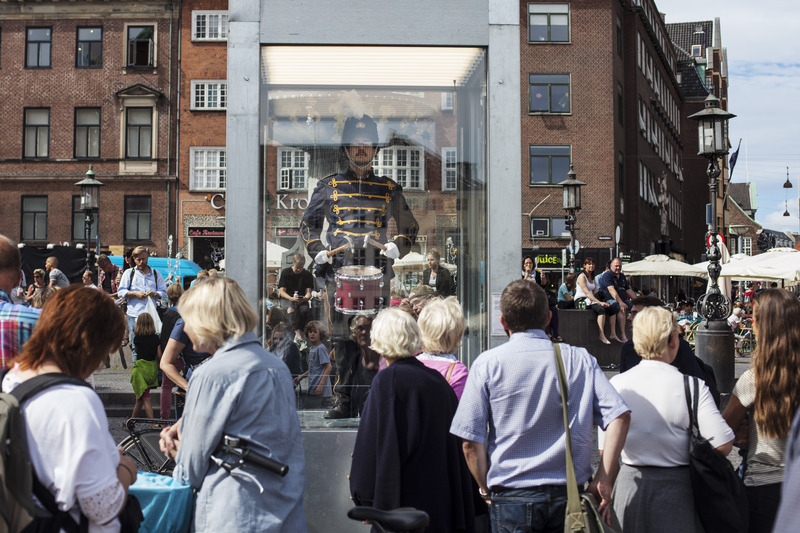 The box is placed at the busy shopping street Strøget in one of Copenhagen’s many squares, Gammel Torv. It is full of entertaining clowns and musicians, Copenhageners and tourist shopping. The metallic sound from the shutters draws attention and the people passing by stop to see what is inside the box. The clown stops his balloon show and comes closer to get a glimpse of what the crowd is looking at. A man in blue uniform with gold embroidery, a fur hat with a feather appears playing at a drum with two hammers. “It must be hard to keep the poker face!”, the Danish women continue. The drummer looks like he could go on forever and the audience is waiting to se what is next. Classical music flows out of the glass box and surrounds the audience as they crowd around box. The performer starts to intensify his hammering in a strict rhythm. The movements are getting more destructive and the audience becomes aware of what is happening: “He is smashing the drum! ?”, a mother says. Her young son is quite overwhelmed by the action of the performer: ” Why is he doing it?”, he asks. “No idea, come”. They leave. Other people stay a little longer to discuss what they see and what it is about. “Is it the Die Blechtrommel (Bliktrommen)?”, a German couple asks each other. “No, is art..”. She replies: “It is definitely not art!”. Two children and their father arrive. “Is that a real man? How can he breathe? Why is he inside the box?”. They are not the only one getting the impression that some one locked him up. A group of young boys is watching: “ He is smashing the drum – it is a waste of money.” The drummer continues. Some people, who have no other place to sleep than at the square, find a spot closest to the window and starts dancing to the drum rhythm smiling to each other. A big number of youngsters arrive with their art teacher. They stand as close as possible and imitate the drummer’s movements and drum along. The drummer is now on his knees smashing the drum into small pieces. Some teenage boys are running towards the box: “What the f*ck – why?!”. The children from school class read the text on the side of the box along with many other in the audience: “It says that this isn’t art actually”, a boy laughs. The subject changes into challenging the drummer to make him laugh, which is the thing many children do when visiting the queen’s guard. The people passing by later in the evening time find the drummer lying still on the floor with his hammers. His eyes are open, but he does not make eye contact with the viewers anymore. “Is he dead?”, a group of young people ask each other. “No, of course it is not a dead man.” Still the crowd is quieter and they stay until the shutter goes down. The artist manifesting himself as a destructive force had a short upswing in the 70’s and 80’s, partly under the influence of punk and squatter movements. He was the spokesman for a generation that revolted against the establishment, bourgeois ethics and the prevailing culture. The revolt eventually became institutionalized. From the 90’s onwards, public facilities as well as foundations promoting art had become part of the economic system. People’s need to man the barricades has diminished. There is, however, a growing need for beauty, conceptual art and entertainment. Kunstneren som manifestation af destruktive kræfter havde et kort opsving i 70’erne og 80’erne, bl.a. under indflydelse af punk- og BZ-bevægelsen. Kunstneren var talsmand for en generation, der gjorde modstand mod det etablerede, mod borgerlige værdier og mod den herskende kultur. Oprøret blev efterhånden institutionaliseret. Fra 90’erne og frem blev institutioner og fonde, der promoverer kunst, en del af det økonomiske system. Folks behov for at bemande barrikaderne mindskedes. Der er i stedet et stigende behov for skønhed, konceptuel kunst og underholdning.